So sorry it has taken so long for a new blog post. 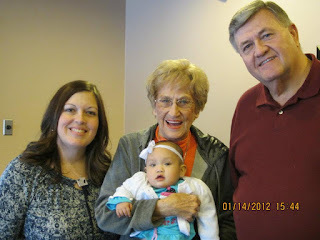 The photo above is me, my grandmother, my dad, and Amber Joy in our "four generations" photo. It was very special! Amber Joy is doing great since we got home. She has let us know her personality in a big way! She can be very content, smiling and laughing, and then the next, she is literally screaming at the top of her tiny little lungs letting us know that she is NOT happy! :) She goes from zero to sixty in about 2 seconds. She is strong and lively and is very healthy. For those of you who don't know, she was born at 26 weeks gestation and weighed only 1.5 lbs. Now she's nearly a year old and is up to a good 14.4 lbs. I had every intention of blogging about our trip to Taiwan today, but alas, a little baby girl is awake early from her nap, so it will be another day. Thank you for your prayers as we continue to adjust.